A washing machine is a machine that washes dirty clothes. It contains a barrel into which the clothes are placed. This barrel is filled with water, and then rotated very quickly to make the water remove dirt from the clothes. Most washing machines are made so that detergent (liquids or powders) can be put into the machine. These can help make the clothes cleaner. There are two main types of washing machines. A top loading washing machine. A front loading washing machine has a door in the front. The clothes to be washed have to be put in and the door closed before the barrel can fill with water. This type of machine can have a clothes drying machine stacked on top to save space on the floor. 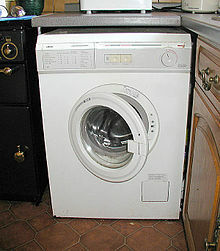 Because of the water used, the washing machine is heavier than the dryer so the washer is at the bottom. An example of a stacked arrangement: a top loading washing machine and clothes dryer. With a top loading washing machine, the opening is at the top. The barrel can be filled with water and soap before the clothes are put in for washing. This type of machine can not have anything placed on top of it because of the opening there. Sometimes a washing machine and a clothes dryer are put together. The washing machine is usually on the bottom of the stack because the water in it makes the machine heavier than the dryer. In this arrangement the washing machine may be front-loading or top-loading. For the top-loading washing machine, room must be left to open the door at the top to add the clothing to be washed. A front-loading washing machine can have the dryer sitting on top of it. This page was last changed on 18 December 2018, at 11:39.